Wow - 7 months! It officially feels like I have an "older" baby now. 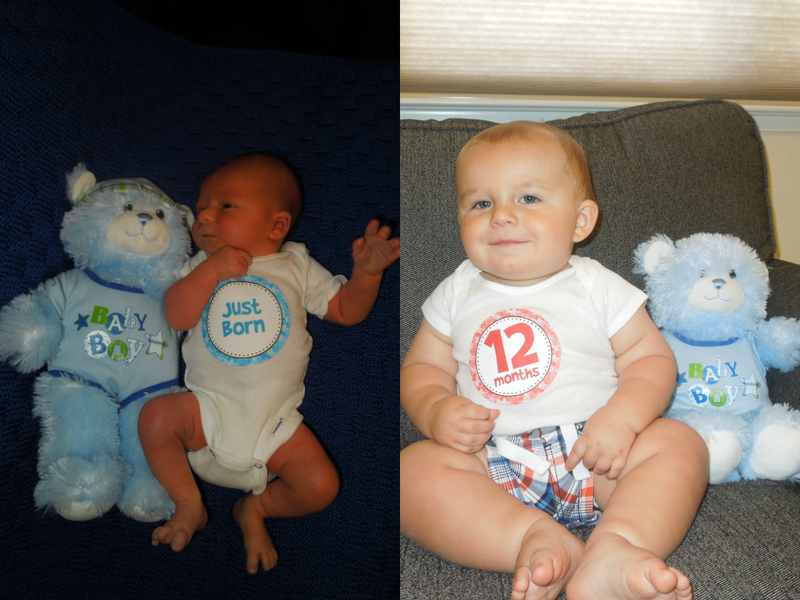 Crazy that he is now closer to being one year than he is to his birth! Landon has continued to grow and change throughout the past month; and I still find it pretty extraordinary how much can change in just one month. He babbles up a storm these days! He makes several different sounds, but the ones we hear the most are "yayayaya" and "dadada". Looks like he is more likely to say "dada" first than "mama" although we have heard him babble both sounds at times. He sits like a pro and loves to sit on the floor and play with his toys. He is becoming more independent with play time so sometimes Mommy and Daddy can get things done while Landon plays on the floor by himself. He's gotten so good at grabbing things - even when it looks like they are too far away! He is a master of the sippy cup now! We introduced it just before he turned 6 months and he can now use it by himself most of the time. He learned with a sippy cup that has a straw - so now he can use a regular straw too! Mommy shared her water with him the other day...what a big boy! Can't forget that this month was his first Xmas! Boy oh boy was he a spoiled boy!! The holiday was a whirlwind and very exhausting for all of us, but it was so special to experience his very first Christmas! Landon loved presents and was able to tear at the paper some (although mostly he just tried to eat it). Christmas is such a different experience as a parent - the joy you remember feeling on Xmas morning as a child is the same joy you hope your own child will feel. I cannot wait for the Christmases when he is older and understands the concept. Here he is with one of his favorite new toys!